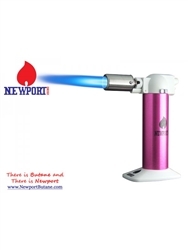 The Newport Zero Pink Torch is a very powerful torch with adjustable flame and constant on lock feature. The body of the Newport Torch is comfortable to hold or it can easily be set on a table for hands free operation. The Newport Zero Torch comes in a retail display box and can be hung on a peg hook. There is a life time warranty on the Newport Torch directly from My Store Supplier, so if anything goes wrong you can send it back for a replacement torch. Please note that for the Newport Torch to work you will first need to fill it with butane, as it ships without any butane inside.